M+B is pleased to announce the exhibition HOWARD L. BINGHAM: THE RUMBLE IN THE JUNGLE. Poignant, knowing, rich with insights and tributes and in both color and black and white, THE RUMBLE IN THE JUNGLE chronicles Muhammad Ali's legendary trip of 1974 to Zaire (now the Democratic Republic of the Congo) to fight a heavily favored George Foreman in the first world heavyweight boxing championship held on the African continent. 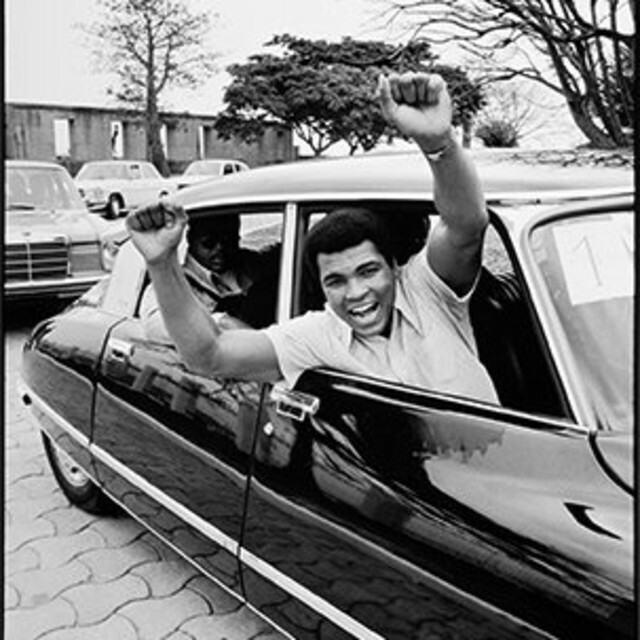 Ali's reclamation of the heavyweight title in the fierce and dramatic match stunned critics and sparked joy throughout the world. While the match serves as thematic nucleus, Howard Bingham's photography covers Ali's entire eight-week stay, recounting the event in all its dimensions, including a star-studded musical festival, buzzing paparazzi and impinging politics. Beyond Ali's athletic prowess, Bingham's photographs also probed Ali's gentler side outside the ring: the hero hailed by village kids, the irrepressible clown in the center ring, the celebrity kissing babies and the private man with his family. Sharing the world spotlight was a dictator eager to gain international respect at a cost of millions to his poor nation; visiting celebrities such as Norman Mailer, Don King and George Plimpton, and music luminaries including James Brown, B.B. King, the Pointer Sisters, Bill Withers, and Miriam Makeba. Held in conjunction with the fight was a music festival, billed as the African Woodstock. A renowned photographer, who is also Ali's longtime personal photographer and close friend, Bingham documents this event as both a cultural extravaganza, and as a landmark in American and Zairian life. Howard Bingham is one of the most important and celebrated photographers of the 20th century. Beginning his career as a newspaper photographer, his work subsequently appeared in Life, Look, Time, Newsweek, Sports Illustrated, People, Ebony and numerous international publications, documenting many of the most important events and personalities over the last fifty years. Most recently, his photographs were featured in Taschen's GOAT , a dazzling, limited-edition publication that documents the life of Muhammad Ali. Bingham's work and contribution to the field of photography has not gone unnoticed: the Smithsonian Institute in Washington D.C. and Fowler Museum in Los Angeles have exhibited his work, and he was the 1997 recipient of the ASP International Award presented by the American Society of Photographers. Bingham is a Member of the Board at the George Eastman House, a recipient of the Kodak Vision Award and a Kodak-sponsored scholarship in his name goes to a deserving minority photography student at the Rochester Institute of Technology. In 1998, he was named Photographer of the Year by the Photo Marketing Distributors Association (PMDA), and the Watts Labor Community Action Committee is planning a media center in his name for the purpose of teaching photography to young people living in South Los Angeles. In 2004, he was appointed Honorary Curator of Photography at the Muhammad Ali Center in Louisville, Kentucky, and he was the 2006 recipient of the Gordon Parks Choice of Weapons Award.